CEOs and senior business leaders are increasingly placing their trust in experts such as academics, consultants and technical experts. A 2011 report from the Edelman group points to a dramatic rise in leaders turning to ‘credentialed spokespeople’, so-called experts. But is ‘expertise’ really all it’s cracked up to be? In 1984 The Economist set a challenge to four different groups to predict what the stock market would look like in ten years time. The groups were made up of four former finance ministers, four company chairmen, four Oxford University students and four London dustmen. Ten years on, who came closest? Of course, it was the dustmen, with the finance ministers trailing in last place. A study of 82,000 predictions by 284 experts over a 16 year period on issues ranging from the fall of the Soviet Union, oil prices, the Arab Spring and 9/11 showed that the so-called experts got no more right than a monkey randomly sticking a pin in a board. According to Noreena Hertz’s fabulous book Eyes Wide Open, a 2012 challenge run by The Observer pitted a team of professional investment advisors against a ginger cat called Orlando. Whilst the professionals studies the stock market and used their decades of experience to select winning stocks, Orlando made his choice by pushing a toy mouse onto a grid of numbers. At the end of the year, Orlando ended up with an impressive 11% return, compared to the ‘experts’ measly 3.5%. As Hertz says: “experts are taken at face value simply because they are perceived as being expert.” She points to a recent experiment in which a group of adults were asked to make a financial decision while contemplating an expert’s advice. An fMRI scanner measured their brain activity as they did so. What happened next shocked the researchers. When faced with expert advice, the independent decision making parts of the participants’ brain effectively switched off. An experts speaks, and we stop thinking for ourselves. In her book, Hertz calls for greater consideration of what she calls ‘lay experts’ – those people with skills and experience from the front line. “Traditional experts come to the table with particular skills and knowhow,” she says. “They are valuable, yet all too often they make their pronouncements from on high, without sufficient mindfulness of context or local conditions. Lay experts, on the other hand, have their feet on the ground. This means that they are capable of delivering insights that those looking down from up top, however qualified, may never discover or volunteer.” We need instead to tap into what Nobel prizewinning economist Friedrich Hayek describes as “the dispersed wisdom of those on the ground.” They may not have the PHDs and the fancy job titles but they almost certainly know what’s best. When faced with a challenge, expensive consultants are not always the answer. And I’m speaking as a consultant, so I’m effectively saying, don’t hire me. This entry was posted in Leadership, Thoughts and tagged Experts on September 7, 2014 by creativecommunicator. I once worked for a CEO who refused to spend money on measurement. He once said to me “what would you rather put your trust in – a spreadsheet compiled by an expensive consultancy … or your gut? No, this is the best measurement tool”, he said, patting his stomach, “and it’s free.” At the time, I didn’t really know what to make of it. I thought he was just tight. But now, with the debate about comms measurement and ‘proving the ROI’ raging fiercer than ever, I find myself coming back to that brief conversation more and more. I have to admit here, and I say this with some trepidation, that the whole measurement agenda leaves me a bit cold. In fact, it bores me senseless (cue disapproving tutting sound from my fellow comms professionals!). Don’t get me wrong, I’m not anti-measurement. I get the whole evaluation thing. I’m just saying I find it really dull. In fact, I’ll go further, I actually find much of the debate pointless, distracting and unnecessary. A lot of comms measurement seems to be about justifying investment (valid) or making comms people feel good about themselves (less so), not about improving the craft or indeed the quality of the outcome. I just don’t find a lot of measurement particularly enlightening. The thing is, communication is soft, measurement is hard. Trying to produce data to prove the causal effect of a communication is like trying to write a business case for love, or measuring the sincerity of a smile, or the warmth of a hug. Communication is emotional. The things we want to measure are understanding, belief, commitment – these are emotional responses. But we know that people find it hard to express their emotion in words or tick-boxes, because the part of the brain that handles emotion has no capability for language. Asking people to describe how they feel about an event, a message, a channel or an experience is asking for trouble, or blandness. No, the best way to measure emotion is with emotion. Let’s face it fellow communicators, when something you’ve done has worked well you’ve instinctively known it haven’t you? 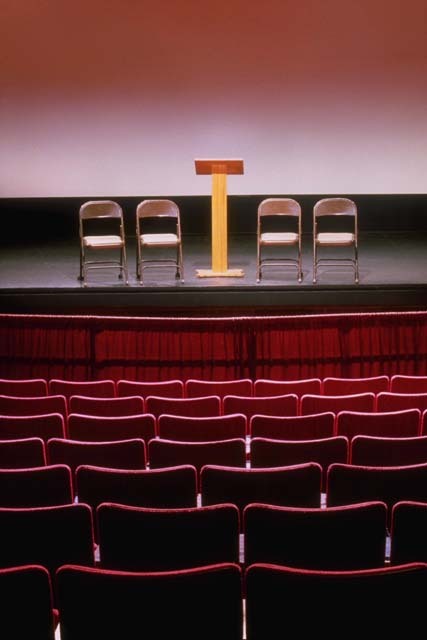 Have you ever been to a communication event and been genuinely surprised by the feedback? Be honest now, if it went well, you knew it from the buzz and the vibe didn’t you? When it went badly, you could read it on the faces as they left the room. How many times has your company spent thousands on a staff survey to tell them “what we already know”? When I work with new organisations, they sometimes send me spreadsheets and PowerPoints detailing the recent staff survey. But I can get more from saying “forget the survey, just talk to me”. The insights are always more valuable, and probably more accurate. This entry was posted in Communications, Thoughts and tagged gut, instinct, measurement on April 30, 2013 by creativecommunicator. A recent post on HBR warning about the unhealthy consequences of ‘sitting’ (in other words, the amount of time we spend on our backsides!) in the workplace and the healing and creative advantages of walking has got me thinking about how much good communication is lost by chair-based apathy. The post, from businesswoman Nilofer Merchant points out that we spend an alarming 9.3 hours a day on a chair as opposed to 7.7 hours in bed. That’s a lot of sitting. Certainly, when I think back to my early working days (in an insurance office) I would spend much of my day walking up and down stairs and across the office floor to actually speak to people (oh, how retro). Now I work from home and I sit down for most of my day. No wonder I have back trouble (although since the new year I have taken to walking at least three miles every day, which I’m loving). Nilofer’s HBR post neatly sets out (as if we didn’t know) the impact on our health of ‘too much sitting’ (a “lethal activity” according to one doctor), so why aren’t organisations doing more to stop their workers from spending so much time on their derrière? And is there a role for us communicators here? We could start by encouraging stand-up and walking meetings. As Ms Merchant discovered when she started holding ‘hiking meetings’, the quality of interaction and outcome actually improves when you meet on the move. Your concentration improves, mobiles are removed and creativity goes through the roof (well, it would if there was a roof!). There’s plenty of evidence about the creative benefits of walking too, as I have mentioned before. The great outdoors removes the physical barriers of the workplace and exposes us to natural stimuli, which feeds our brain with ideas, inspirations and perspectives. Team walking, or just generally meeting standing up, is more sociable too. It gives us the opportunity to interact with the whole team, collectively or individually, rather than just the ones who are sitting up our end of the table. Walking allows for natural periods of silence, during which we can reflect and think – all very healthy in a creative context. In a typical sit-down business meeting, we don’t tolerate silence. We expect someone to be talking the whole time. Not everyone wants to be dragged out on a five mile hike up a hill (I do) but it could just be a stroll around the block or a walk in park. I once worked in Berkeley Square in London and we would sometimes use the square for impromptu team meetings. It was the most creative time of my working life. We communicators should team up with the people who look after health and wellbeing in our organisations and do more to encourage comms on the move – walk ‘n’ talk. We should be pushing, and role modelling, new and creative ways to interact. For most organisations, encouraging people to undertake the serious business of work in anything other than a corporate environment is too big a leap of faith for them to take, which in many ways underlines the way companies suffocate creativity. Most managers would be worried about peer judgement if they were seen to be taking their team out for a picnic meeting or a creative hike. That, of course, is not a reason to not do it. Maybe we can start by running a few campaigns to encourage innovative interactions? Putting all our comms online may have its benefits, but the health and wellbeing of the receiver is not one of them. This entry was posted in Communications, Creativity, Thoughts and tagged sitting on January 17, 2013 by creativecommunicator. I’ve had my head in some neuroscience books over the holidays. One of the areas I’m currently interested in is what happens to us when we have choices to make. I’m sure we all instinctively feel that choice is a good thing – the ability to choose gives us empowerment, helps us to tolerate adversity and makes us feel in control. We value the ability to make choices in our lives and can only imagine how unbearable it must be to be stuck without options, to have no way out. Psychologists have proven that we feel better when we have choices in our lives. We even enjoy a meal more if there is choice on the menu. Those of us growing up in affluent developed nations take our ability to choose for granted. And no better is this choice-fest demonstrated than in the way we consume information. I’m old enough to have grown up with only three channels on the telly (in black and white when I was really young) for part of my childhood. I remember getting excited by Ceefax when it first came out because I could read the news or get the footy scores on the TV without having to wait until the allotted bulletin. Now look. The internet and other technologies have opened up a whole new world of choice at our fingertips, and we internal communicators try to replicate this choice with integrated channels, message frameworks and layered content. We fall over ourselves to gather feedback and opinions, we ask people to complete surveys and we encourage them to tell us what they prefer so we can meet their needs. Of course, it feels right to do that, because giving people choice makes them more engaged. But there is a downside to choice, as Aesop’s famous fable of the fox and the cat demonstrates. Faced with a pack of snarling hunting dogs about to bear down on them, the two animals need to escape. For the cat it’s an easy decision to make, and he bolts up a tree. But the cunning fox, blessed with all his knowledge of the various escape options, becomes paralyzed by indecision and falls prey to the dogs. With too many choices on offer, he suffered from analysis paralysis. This ‘paradox of choice’ confronts many of use every day. How often have you stood in a supermarket aisle trying to choose between the 250 varieties of biscuits on offer? I heard on the radio the other day that most people don’t bother to change their gas and electricity supplier because there’s ‘too much choice’. Psychologist Barry Schwartz says that the more choices we are given, the less ‘free’ we become because we procrastinate in trying to make the best decision. So it seems that, while choice is a positive force for good, too much of it can be detrimental. Bringing it back into our world, I sometimes believe that we are in danger of ‘over-engaging’ our people. I know some companies that complete their annual staff survey, publish the results and then go back out to re-survey the same audience to ask what they meant and what should be done next! Sometimes people just want to be asked once and then they expect action. We can over-do this choice thing because we’re worried about being accused of not engaging with our people. But sometimes we need the cat not the fox. This entry was posted in Engagement, Neuroscience, Thoughts and tagged Choice on January 6, 2013 by creativecommunicator. Comms people need to wrestle strategic control of the technology that enables this to happen. In my experience, most comms people don’t see ‘collaboration’ as part in their remit beyond using tools like Yammer as a comms channel. But here’s where we need to drop the silo thinking and look more holistically at the workplace in general. Collaboration is a form of communication and engagement, as is knowledge transfer, learning, formal training, idea sharing and community building. We can’t (and shouldn’t try) to manage all these things, but we should recognise the part they play in building a communication culture. Purpose is the new black. Anne-Lise talked about the importance of work having a higher meaning. Purpose is what drives people. I love her line “If you can’t feel it, it’s not making a difference.” It’s a point I keep making here on this blog. Engagement is about emotion and if you want emotion you have to aim for that part of the brain that deals with feelings. A brilliant engagement example from the insurer RSA (where I cut my comms teeth!) showed what happens when you give people a reason to express themselves and be proud. Metaphors work. David Harrington from Shell showed a video to demonstrate the conflicting priorities and unintended consequences of managed push communication. The amateur staff-made video shows a customer in a restaurant being bombarded with cakes from a number of different waiters – each portion of cake representing a different corporate message. As the waiters deliver well-intended individual servings we see the poor customer’s plate pile higher and higher with cake and her face drop lower and lower with confusion. A perfect visual analogy to demonstrate a common problem. For many delegates, the ‘cake video’ remained the one big takeaway. We need to be more creative. Of course, given the name of this blog, this is the area I’m most passionate about. I really want comms people to realise that creativity is different from creative. Creative is what we buy from creative agencies. Here we’re buying production – an output. And jolly good these outputs are too, many of which were superbly demonstrated at the conference by the likes of Kingfisher, M&S, Syngenta and RSA. BUT, creativity is not the same thing. Creative agencies are great at production but they don’t have exclusivity on creativity. Creativity is a skill, a behaviour and an attitude, and it’s an ability we all have. We just need to know how to use it and have the confidence to do so. The need for creativity came up time and time again at the conference. I am now even more convinced that creativity is the BIG SKILL that communicators need for the future. I’m not the only one. A recent survey of global CEOs highlighted creativity as the “number one skill” organisations need to learn to face the complex challenges coming down the track. We should be at the front of the queue. Most comms are pointless. OK, that’s my take on it but the Shell presentation highlighted what we all know … most people don’t engage with outgoing push comms. David’s data showed that 85% of Shell videos had less than a hundred views and an even greater proportion of online articles had less than a hundred hits, out of an audience of many thousands. The phrase “in a land without data, my opinion is king” resonated with many people. Understandably. Comms should be a disruptive force. Benedikt Benenati from Kingfisher gave a great presentation about his belief that internal comms can and should drive change through forceful and sometimes disruptive interventions. Getting people out of their comfort zones, making leaders ask their people for help, forcing issues like the elephant in the room (with a life-size model elephant!) and generally being a nuisance. I like what he said about not wanting a big budget and deliberately keeping his team lean in order to drive up creativity. I also like the fact that he doesn’t want his team to be ‘part of the system’ because that would make them too safe. An argument perhaps for comms to not be at the top table, but outside throwing stones in through the window. I don’t like conferences. Nothing against this event, very well staged by Melcrum, but personally I just don’t connect with conferences. Maybe if I was in-house I’d feel different but being on the agency side I just don’t like the predatory atmosphere. It’s not my natural environment to hand out business cards and compete for attention. It’s too false for me. I’d rather take the name badges off and just have a nice chat. This entry was posted in Communications, Thoughts and tagged Conference, Melcrum on October 12, 2012 by creativecommunicator. Here’s how you could spend your day. A quick shower, an energy bar and a scan of the papers before catching the express train to work, on which you speed read the executive summary of yesterday’s meeting. You then spend a day having power meetings, sending instant messages and calling colleagues (on speed dial) about the fast track promotion you’ve been offered. Lunch would be fast food washed down with Red Bull and a power nap. On the way home, you stop off for an instant spray tan to look good for the speed dating session that evening. You end the day checking urgent emails via your superfast broadband over an instant coffee and a 60-second news round-up . You live life in the fast lane. You’re a real speed demon. Or, just maybe, you could SLOW DOWN. 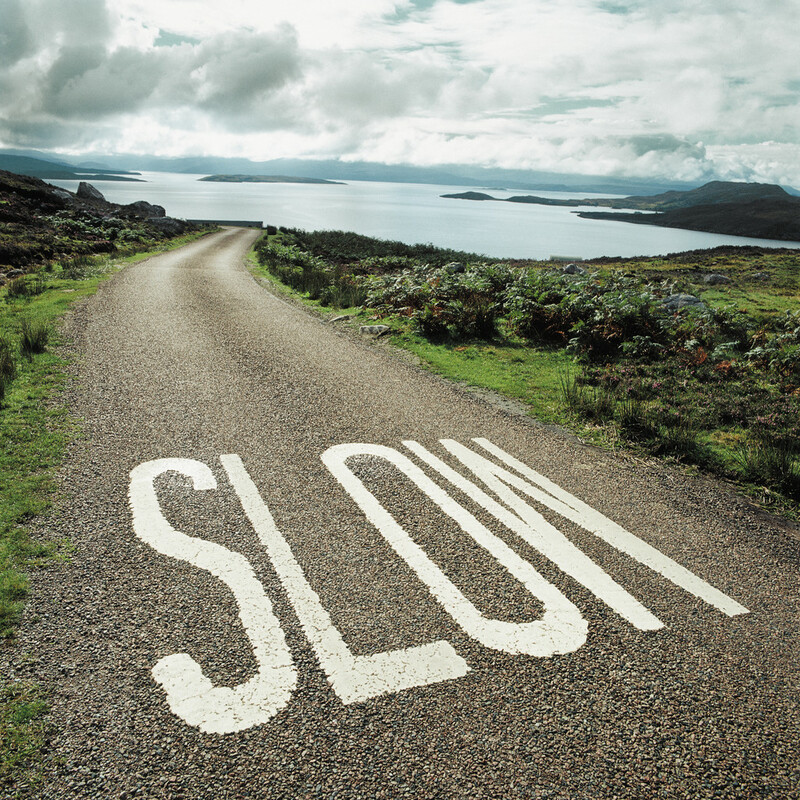 There’s a growing (I was going to say fast growing) trend for slowing down. Take the International Slow Movement for instance. It began in Italy in the eighties as the Slow Food movement to advocate slow, leisurely dining with friends and family using local, organic produce. It’s symbol is a snail and it now has 85,000 members in 50 countries. The movement has now grown to include Slow Travel, Slow Cities, Slow Art, Slow Parenting and Slow Gardening (and others). In London, the Idler Academy of Philosophy, Husbandry and Merriment aims to revive the pedestrian spirit of Plato’s Academy and eighteenth century coffee shop conversation. 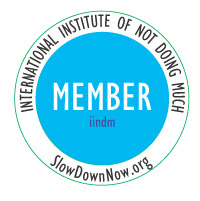 I also came across the wonderfully titled International Institute of Not Doing Much (IINDM), whose Slow Manifesto includes classics like “we shall slow down in the fields and in the streets, we shall slow down in the hills, we shall never surrender!” and “some are born to slowness—others have it thrust upon them.” They have 4,000 members and according to their brilliant website: “Over the past few centuries, our wise members have been pondering the nature of effort. On the whole, we don’t like it.” I’ve joined up. But there’s a serious side to slowness. In the West especially, we have this inbuilt ‘time is money’ mindset and that if you’re anything other than ‘mad busy’ then you’re seen as lazy, weak or a failure. How many times do you say to a colleague in the office “are you busy?”. What would you think if they said “nah, not really”? Evidence shows that speedy work is bad for your health, bad for wellbeing and bad for productivity too. Working hours in the UK are longer than anywhere else in Europe and yet Scandinavian countries – where they work the fewest hours – are among the most competitive nations in the world. According to recent surveys, around a quarter of Americans ‘always feel rushed’ and 20% of Brits skip lunch. Even the siesta is on its last legs in Spain. But ‘fast is not always best’ is a message that’s beginning to gain some traction. Companies are investing heavily in wellbeing programmes and some are introducing ‘quiet spaces’ for workers to go and recharge their batteries. Can we communicators help? Should we be developing our own strategies for Slow Communication? Maybe we should be more considered and planned in our message delivery? Maybe we should review the language we use to cut down on the ‘fast adjectives’. Maybe we should warn against communications that talk about speedy benefit delivery and step-change initiatives. Maybe we could encourage measured and thoughtful briefings? Maybe we should stop doing 50% of the comms work we think the organisation can’t survive without (trust me, it can). Maybe we should introduce well crafted prose that takes time to read instead of the half-cocked, ambiguous and jargon-filled email that we rushed out in ten minutes to half the workforce. Bring back the printed newsletter. Double the length of team meetings. Play classical music at town hall events. Hand out cigars (OK, that one’s a joke). Spike the intranet so it takes twice as long to download (that’s only half a joke). Train managers on the art of conversation. Hold coffee-shop debates on key issues. Have comms that ‘reflect on’ and ‘walk through’ big issues. Move the message focus away from ‘the final outcome’ and more towards ‘the stopping points along the way’. Have more tea breaks. Encourage your audience to read and think, not scan and ignore. If you’re really keen, have meetings with no actions, practice looking out of the window and invest in an office tortoise (this is getting silly, stop me someone). Finally, when you next think only an email will do, remember this. Before the telegraph connection between England and Australia in 1872, a letter you sent to your cousin in Sydney would take 110 days to arrive. You’d get a reply after seven months. 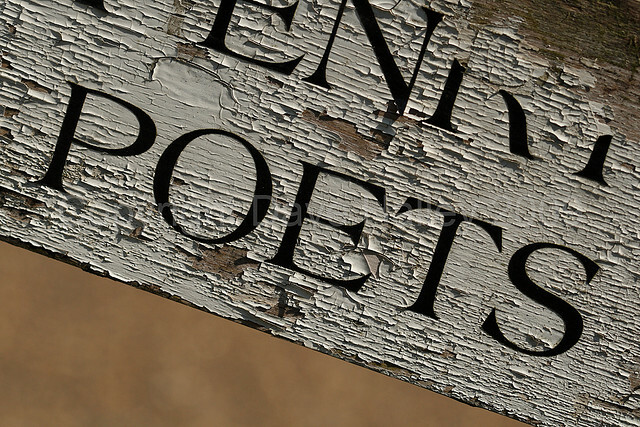 This entry was posted in Communications, Thoughts and tagged Slow on September 14, 2012 by creativecommunicator.